Good evening everyone! Halloween is upon us and if you're like me you've yet to find a costume. I was able to get my son to go from not wanting to be ”N-NEE-THING” to being a bumblebee (serious sideeye) to Batman! Thank you sweet baby Jesus wrapped in tattered cloths lying in a manger!!!!!! 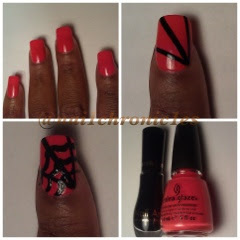 In efforts to inspire him to be something (Spiderman) I came up with these easy and fun nails. It didn't work but he loved the nails...go figure! If you follow me on FB or Instagram you know I do tutorials for an online city guide magazine (My Urban Access) but this is my first tutorial on the blog. So let's hop in. I used China Glaze Roguish Red from their 2012 Wicked Collection. Roguish Red is actually a very pretty orangey-red. This is two coats here. 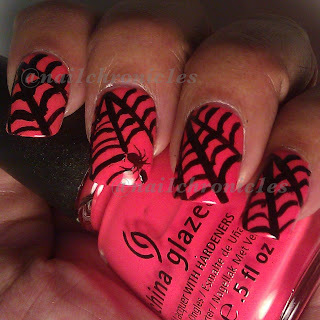 I stamped the spider on using Shany plate 09.